inspection and calibration due date information and alerts for workshop equipment of any type,make or model. This enables workshops to keep track of all their equipment in one place, whether it’s MOT testing equipment or any other equipment that is legally required to undergo scheduled safety checks such as service lifts, trolley jacks, compressors etc. 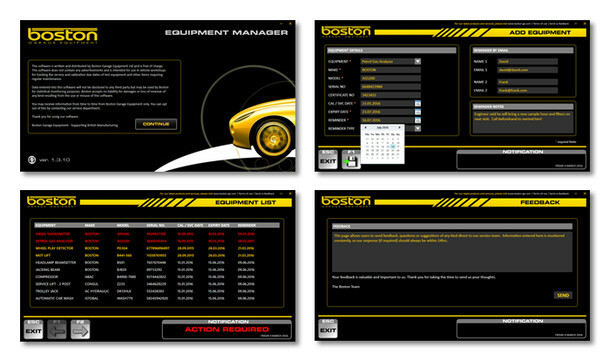 Designed in-house by Boston’s software department, Equipment Manager is completely FREE to all testing stations and trade businesses to help them keep track of upcoming equipment calibrations and services. Since the DVSA switched over to its new on-line web based MOT system, testing stations are no longer able to enter equipment serial numbers and calibration dates. This useful tracking function and the automated calibration reminders were therefore lost. Responsibility to record calibration due dates for MOT test equipment now falls upon the Authorised Examiner and garages run the risk of penalty points or more serious disciplinary action if calibrations are not kept up to date. By using Equipment Manager, workshops can very easily keep track of all of their equipment service dates and will receive scheduled alerts (on-screen or via email to multiple addresses) to remind them of their upcoming inspections. To download the application, see our Equipment Manager page.